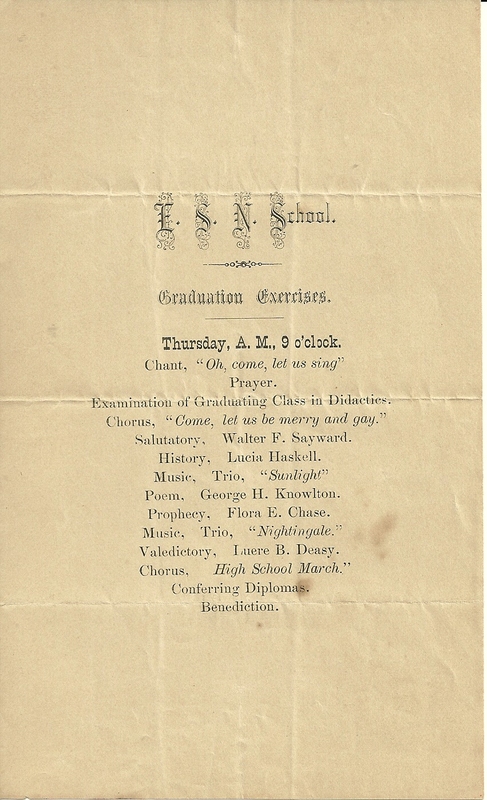 Lucia Haskell, mentioned above as the reader of the Class History at the graduation of the Class of 1881, Eastern State Normal School, Castine, Maine, was born about 1859 in Maine. 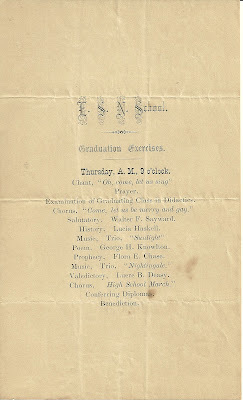 See another post which features scans of all of the pages of the catalog for Eastern State Normal School for the year ending June 3, 1881. The catalog contains names and home towns of trustees, faculty and students. Lucia's parents were Dr. Peleg Sprague Haskell and wife Almira P. (Page) Haskell. Dr. Haskell, born at Hartland, Maine, on 11 May 1832, was the son of Captain Peleg and Lois (Fogg) Haskell. Dr. Haskell attended Hartland Academy, Colby College, New Hampshire Medical School and Maine Medical School, graduating from the latter in 1856. About that same time he married Almira P. Page, who was born about 1835 in Maine, possibly at Hartland, the daughter of John and Rachel Page of Hartland. Dr. Haskell started his practice at Hartland, but moved his family and practice to coastal Stockton, Maine, after a couple years. Almira bore two children, Nellie Mae Haskell and Lucia Haskell, the subject of this post, before dying on October 19, 1865 at Stockton, Maine. Dr. Haskell married Sarah A. Blanchard on 2 June 1867 at Stockton, Maine, and had two more children with her: Blanche Haskell and Sprague Fogg Haskell. In 1879 Dr. Peleg Sprague Haskell moved his family to St. Paul Minnesota. Lucia stayed behind with her grandparents, John and Rachel Page, as she may have already been at Eastern State Normal School by that time or was planning to attend. I'm assuming Lucia worked as a teacher for a few years, before marrying Archibald Gee in 1887. He was born about 1862, possibly at Orono, Maine, the son of Solomon Gee, Jr., and wife Susan H. (McPheters) Gee. By the time of the 1900 Census, Lucia and Archibald had moved to Minneapolis, Minnesota, where Archie was working as a wholesale hardware salesman. Lucia's father died in 1890, so perhaps they had already moved to Minnesota by that time. By the time of the 1920 Census, Lucia and Archie had moved to Seattle, Washington. They were living with Lucia's maternal aunt, Wealthy Page. Archie was working at a factory that produced orange marmalade. They were still living at Seattle by the time of the 1930 Census, with two roomers, Mrs. Ellis and Mrs. Ridgeway. Archie listed his occupation as fruit salesman.